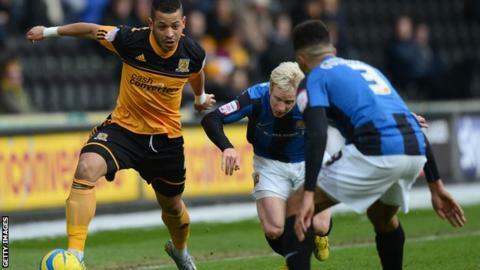 Chris Dagnall fired Barnsley into the FA Cup fifth round as their revival under new manager David Flitcroft continued with victory at Hull City. Hull dominated the first half, Seyi Olofinjana going close with a header before Luke Steele denied Robbie Brady. But Championship strugglers Barnsley responded strongly to record their first away cup win for five years. Dagnall pounced from close range, after keeper Eldin Jakupovic's double save, to win the all-Championship tie. This was Barnsley's first away win in the FA Cup since February 2008 when they produced a major surprise by defeating Liverpool 2-1 at Anfield in the fifth round. Barnsley are now unbeaten in four games, three of which have ended in wins, and Flitcroft will be hoping his players can transform their impressive cup form onto the league stage as they battle against the threat of relegation. In contrast, Hull have won just once in six league and cup games and manager Steve Bruce will view this as a missed opportunity to progress in a competition he won three times as a player at Manchester United. The Tigers carved out the better chances, Olofinjana going close with a header from Brady's 27th-minute free-kick. Barnsley enjoyed their best spell after half-time, with former Aston Villa striker Marlon Harewood lashing a 20-yard shot straight at Jakupovic. Hull midfielder Robert Koren then forced a fine save from Barnsley goalkeeper Steele, who also did well to keep out Brady's free-kick. But the visitors clinched victory against the run of play in the 70th minute. Tigers keeper Jakupovic produced a fine double save to keep out Dagnall and Harewood only for Dagnall to rifle home the second rebound at the far post. "We do not need to panic as there are 18 games left in the season. "But we will see what we can do in terms of bringing someone in, and certainly we do not need any more injuries. "We have let a couple of the younger players go out on loan to get some experience, but we are not close to anything at the moment. We'll have to see if we can get anyone else in, but they have to be the right player." "Our form is down to a group that wants to be part of something special. In spite of where we are in the league, we have an opportunity to put things right. "I love the FA Cup and everything about it. It's a special competition. "Some of the players in the dressing room have great FA Cup memories, and the fans will go back down the M62 with their own memories. I want to go as far as we can in the FA Cup as I'm a massive believer in it."